We got there about 4pm Friday the 21st of december There was a teenage couple sitting in the corner, nobody else. We both ordered the red fish po boy and I ordered fries to go along with them. We waited 30-35 minutes before we got our food and NOTHING was hot much less warm. It actually looked like someones leftovers, thrown on the bun the cheese barely melted, the fish pieces (not a filet) were scattered and falling off the bun. 5 baby shrimp. Only a small bit of cole slaw on the sandwich. The fries I'm certain were left sitting from lunch because they were cold and tasteless. There were probably about 6-7 staff that couldn't be over 21 if that, and I did not see anyone cooking it actually looked like they were cleaning to close. We sat in the car for 10-15 minutes came in and still didn't smell food. When we finally got our food we went 2 miles down the road to Penquin Park and opened our food and would have returned the food but had to be in Independence Mo and didn't have time. We paid close to $30 for food we mostly tossed. I am going to return and speak with the owner/manager because they need to know or they will be our of business in no time. Mudbugs is now one of our families favorite places to dine. The fried basa, Lemon garlic fries, fried okra, gumbo and red beans & rice are a few of our favorites. The quality of the food is amazing and the price is great. Not to mention the incredible service! Try it out, you will love out! The food is absolutely delicious. Generous portions and a great menu. The seafood jambalaya is to die for! Will be visiting again soon. well first time going in there and its a nice cozy little place. the waitress was friendly and let me sample a couple things off the menu and i was impressed. i ordered the shirmp po boy and i tell you what they fill that thing to the max. you will not be hungry after eating that po boy. i got to go back in and try some others they have. prices are really good also. i recommend trying the place out. First time eating from this place. The food was great. Staff was courteous, but maybe a bit overwhelmed as it seemed to take a small while to get my order. The jambalaya was excellent and the Po Boys were huge. They definitely do not skimp on the portions here. Will definitely eat here again. 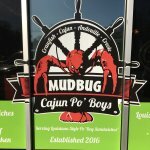 Been to Mudbug Cajun Po' Boys? Share your experiences!